Your favorite English class on steroids, that’s the only way to describe this year’s Sigma Tau Delta convention! This was my first convention so I was not sure what to expect, but I definitely did not expect to have as much fun as I did. From the moment I first saw the hotel, which was absolutely amazing, to the moment we had to leave, which was kind of depressing, I had non-stop fun. Attending workshops and fellowshipping with others that had the same passion for English as I did was really cool, as was being able to present my own poetry. Also, I enjoyed exploring the city and trying different foods at the various restaurants. However, one of the most memorable moments I had was when I ran into a friend who graduated in my same high school class. Our graduating class was fairly large, and everyone branched out by going to different colleges, so we knew the odds of keeping in contact with everyone was slim to none; therefore, you can imagine the surprise and joy we both experienced by running into each other after two years. 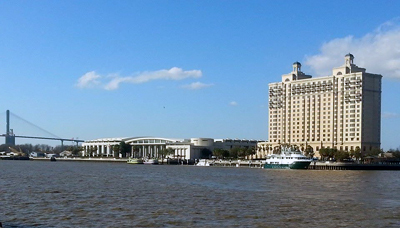 The really funny part of the whole matter is where our reunion took place--at an English Convention in Savannah, GA. At that moment the theme “River Current” really resonated with me. As we sat by the river, staring into the water and watching boats drift by, I couldn’t help but think about the way people drift along in life. I thought about the way life often takes friends in totally different directions, and yet their paths have a strange way of intersecting at the most random places. My love of English, and more specifically poetry, is essentially what brought me to Savannah, and I have absolutely no regrets. As I reflect on the insights I gained from hearing others’ works, and the fun I had making new friends and reuniting with old ones, I cannot help but be excited about all of my plans for the future. I constantly find myself wondering what other exciting places English will take me.